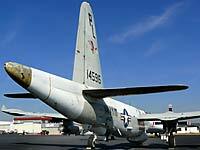 Earlier P2V Neptune's (BuAer Serial # 124422 to 128422) carried 350 gal in each tip tank giving a total fuel capacity of 4,200 gallons or 25,200 lbs. The later versions housed a high intensity spot lamp installed in the right wing tip tank nose cutting the tip tank's capacity down to 200 gallons each. The spotlight was not well liked by P2V air crews as it completely blew away their night vision when fired up. All fuel tanks were self sealing with the exception of the tip tanks. The tip tanks had a Co2 vapor dilution system that flooded the unfilled or empty area inside of the tanks with Co2 when the crew felt the Neptune was in imminent danger of enemy contact and gunfire. The Co2 system was operated by toggle switch from the flight deck and reduced the chance of fuel vapors in the tanks exploding should the tip tanks be hit. 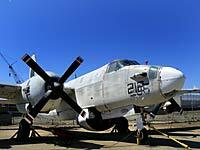 The current restoration captain for this Lockheed Neptune is Bob Weiss, who got me inside the P2V and helped me get some of the details on this page straightened up. Bob is a veteran crew member of Lockheed P2Vs.